. New Mag Fed marker from Tippmann with 20rnd magazine and dual-feed option. The Tippmann TMC with the upgrade every magfed player wants. The Tippmann TMC looks and feels great, modeled after the AR-15, this is the perfect marker for beginners and veterans alike! For those interested in trying mag fed but feel that it comes with a heavy price tag, fear not! 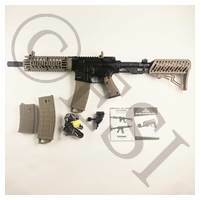 For Tippmann has come up with the most complete package without burning a hole in your pocket. While it’s more affordable, its quality is unchanged with its legendary in-line bolt system and strong lightweight aluminum body it has the same durability and reliability that Tippmann is known for. 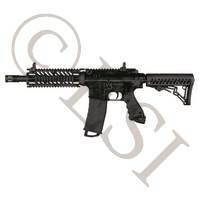 Your Tippmann TMC gives you the ability to choose if you want to play with or without a hopper. The marker was designed for play with a magazine and setup is stock and as simple as filling the 20 round magazines and inserting them into the bottom of your marker. For those who want to play with a hopper converting your marker for it is as simple as adding the feed neck and replacing the current magazine with a mock conversion magazine. Built right into the shroud is a four sided picatinny rail that can accommodate all sorts of upgrades such as, camera mounts, lasers, tactical lights, and an endless amount of tactical upgrades. Already built into your marker are two sling mounts so you don't have to do any additional modification or have to spend any extra money on mounts. Having these already built into your marker means that when in a slinged position you will be able to move more freely due to the weight of your marker going from your hands to your back or shoulder. Having your hands free is an important thing when you need to reload or when switching to a sidearm, with a sling you’ll be able to do both on the fly. One of the most important parts of a Mag fed marker, the magazine, Tippmann did a remarkable job on creating this magazine and when you need to swap magazines the transition is smooth and easy. When the time comes for reloading, the magazine winds down so you don’t have to force the paintballs into the magazine. While the magazine does fit 20 rounds it may be wise to put only 19 if you know it’s going to be sitting around for a while as it may dimple the paintballs if it sits for too long. Whenever you feel like playing with a hopper you have the option to thanks to the included conversion magazine which is shaped just like a regular magazine from the outside but does not hold paintballs instead is solid and features a detent to prevent the marker from trying to load from the magazine. Featuring a high performance 12” barrel to provide you with increased accuracy and with and added Muzzle break to give you a tactical look and improve its performance. 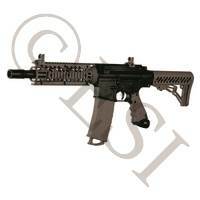 The Tippmann TMC accepts 98 style threads, which mean any barrels with that thread may be used. Keep in mind that like most markers when upgrading the barrel it may become wobbly if it doesn’t fit into the shroud. The stock has a tactical look modeled after the AR-15 and can be extended to 5 different lengths and then easily shortened back down to its original length depending on what is comfortable for you. It is important to keep in mind that while the Stock can come off the buffer tube it sits on does not.